On one particularly hard-hit Kaiapoi street, I spoke to a resident who expressed an increasingly sense of helplessness as aftershocks continued to tear his home apart. His family feared that they would be unable to live in their home for much longer. Others in the neighborhood spoke of frustration that they had not yet received any definitive answer from the council on whether or not they would ever be able to rebuild on their land. Many of these people have clearly endured a difficult ordeal, and have significant emotional investment (not to mention financial), in their land. However, from a purely practical perspective, I wonder; should some of these homes be rebuilt at all? That, I suppose, is a question that will be left to the engineers and planners to answer. 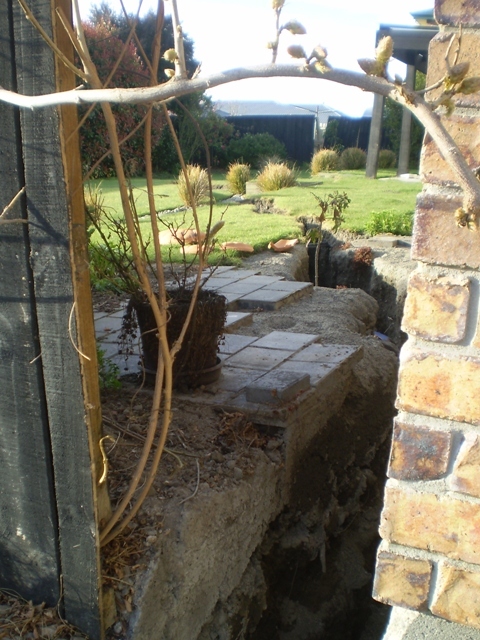 From my perspective of the earthquake damage in Kaiapoi, liquefaction seems to have been the main cause of damage to infrastructure and homes. When soft liquefiable soils are subjected to significant earthquake shaking, groundwater can move upwards, saturating already weak layers, causing increased pore water pressure and softening, which can result in settlement and downslope displacement. Any brittle overlying material riding on top of the liquefied sediment must also move to accomodate this displacement, so the surface layers spread, subside and fracture. This “lateral spreading” commonly occurs on very gentle slopes, and proceeds downslope, generally towards stream channels or similar low-lying soft sediments. In many cases, the land on both sides of the channel are “squeezed” together by lateral spreading from opposing directions. At Courtenay Stream near Kaiapoi, the post-earthquake water level has significantly overtopped the former stream banks, suggesting that in addition to subsidence of the surrounding land, the channel may have been substantially squeezed by lateral spreading. This effect was clearly visible at the nearby rail crossing, where workers were repairing a bridge and section of rail that crosses Courtenay Stream. The bent rails had already been replaced, but the compression of the bridge could still be clearly seen in the iron bands that tie the outside of the railway sleepers together. At several places along the length of the bridge, these bands had been bent upwards as the sleepers were compressed together by lateral spreading from opposing directions. The total compressional displacement across the bridge was in the order of 40-50cm, causing shifting of the bridge abutments, and forcing the construction of new supporting piles under the existing bridge. In Kaiapoi, lateral spreading fractures commonly run parallell to adjacent stream channels, in some cases affecting a swath of land several hundred metres wide. The nature of the overlying substrate appears to have had little or no effect on the propogation of the fractures. Whether paddock, driveway, concrete foundation or wall, the fractures simply continued on through, shredding whatever lay in their paths. 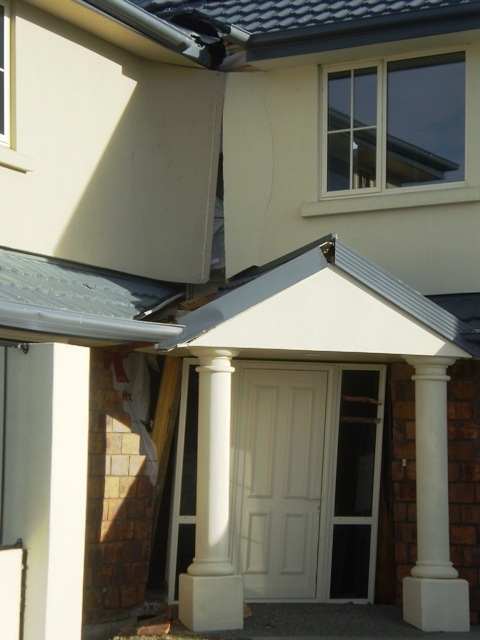 Many homes have been torn in two, in some cases by a single fracture exhibiting more than 1 metre of horizontal displacement, and several centemetres of vertical displacement. I suspect that further analysis of the lateral spreading mapping and other data will confirm that most of these fractures propogated nearly parallel to existing or fossil stream beds. The infrastructure that had been engineered and built on top of those areas was simply no match for the large-scale downslope spreading of the ground surface during the earthquake or major aftershocks. No thickness of gravel building pad, concrete slab, or building wall appeared to be any deterent to the spreading. Houses that had the misfortune to end up in the path of a fracture, ended up in peices. 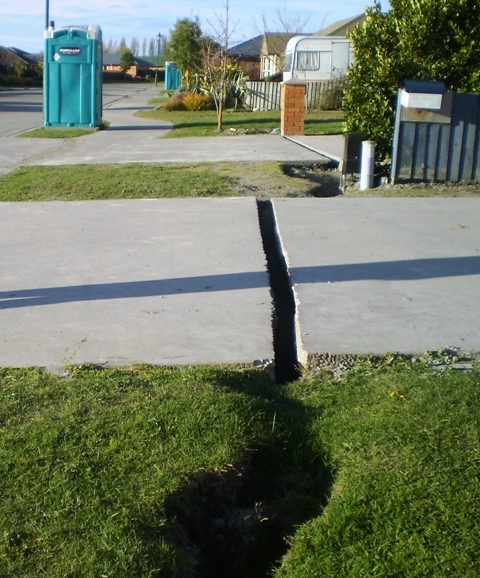 It is important that lessons are learned from the damage in Kaiapoi, and other areas that experienced liquefaction and lateral spreading during the Darfield earthquake. I hope that those lessons will help to ensure that appropriate building standards, and in some cases, restrictions, are considered for future development in areas that are prone to liquefaction. We now have a much better idea of where liquefaction-related damage is likley to occur in Christchurch and surrounding areas in the future. Let’s use that knowledge to better prepare ourselves for the next big earthquake.